Things don’t always run the way we want them to or operate at the ideal temperature out of the box. Instead of spending extra for power controls that may or may not meet your needs, wouldn’t it make more sense to dial in the ideal level from the source? 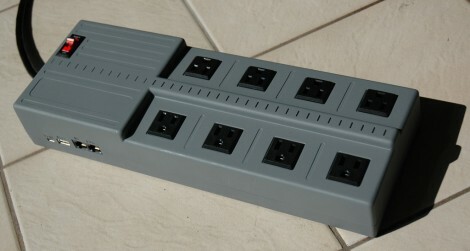 That’s what [dekuNukem] had in mind when he decided to make Powerduino, an arduino-compatible programmable power strip. With Powerduino, [dekuNukem] can control the electrical consumption of all kinds of things without ever worrying about the irreversible deadliness of mains voltage. It actually uses a Teensy 3.1 which can be programmed with the Arduino IDE through the micro USB connector. He’s really tricked it out to the point of putting Kill A Watt meters to shame. A wi-fi module lets him control any of the outlets from anywhere, and the RTC module lets him make customized schedules for them. Powerduino has an SD card slot for logging energy consumption, and a 20 x 4 LCD screen makes it easy to directly interface with the power strip. The Powerduino code is up on GitHub, and [dekuNukem]’s walkthrough video is after the jump. Here’s a USB charging center which [Kenneth Finnegan] built using parts from his junk bin. We’d like to reiterate our claim that he must have the most magical of junk bins (the last thing we saw him pull out of it was a 24-port managed Ethernet switch). The jack on the side accepts the barrel connector from a 12V wall wart. [Kenneth] mentions that the 2.1mm jack is a standard he uses in all of his projects. Inside there’s a switch mode power supply that provides the regulated 5V to each USB port. We really like the fact that he added some protection; diy is no fun if you end up frying your beloved multi-hundred dollar devices. The yellow components are polyfuses which will cut the power if 600 mA of current is exceeded. This works great for almost all of his devices, but his iPod 4G doesn’t like the system. It sees the voltage dip just a bit and stops charging entirely. [Mansour] had a ceramic space heater mounted near the ceiling of his room. Since heat rises this is not the best design. He upgraded to an infrared heater which works a lot better, but lacks the timer function he used on the old unit. His solution wasn’t just to add a timer. 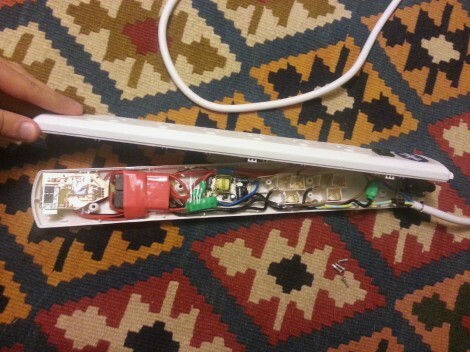 He ended up building a Bluetooth module into a power strip in order to control the device wirelessly. He ends up losing all but two outlets on the strip, but everything fits inside the original case so we think it’s a reasonable trade-off. He uses relays on both the live and neutral wires to switch the two outlets. These are driven via MOSFETs to protect the ATmega168 which controls the board. The microcontroller and Bluetooth module both need a regulated DC power source, so he included a transformer and regulator in the mix. After the break you can see him demonstrating the system using two lamps. There’s even a terminal interface which lets you select different control commands by sending the appropriate character. This interface makes script a breeze. At least this power strip doesn’t spy on you. This rather normal-looking power strip hides a secret inside. It’s called the Power Pwn, and it conceals hardware which facilitates remote penetration testing of a network. It really is the ultimate in drop hardware as you can quickly swap it with existing power strip. Who’s going to question it? It’s got almost all the bells and whistles. There’s dual Ethernet ports, Bluetooth with 1000′ range, and WiFi with a high gain antenna. The SoC inside comes with Debian 6 and all the exploit tools you might want pre-loaded. There’s even a 3G adapter, but it’s external and not pictured above. The thing is, for a pre-order price-tag of $1,295 we think that 3G should have been internalized and come with a lifetime unlimited data plan! That could be a bit overboard… our heads are still spinning from the sticker shock. This isn’t the first time we’ve seen hardware from this company. Their Pwn Plug was used in this project. We just didn’t catch the $595 price tag for that device until now.